Sunday February 11th is 2-1-1 Day! 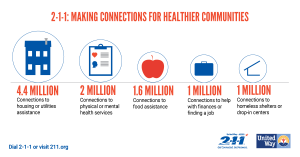 Help Network of Northeast Ohio is part of the 2-1-1 network and the 2-1-1 Center for Columbiana, Mahoning and Trumbull Counties. The entire 2-1-1 network answered over 13.4 million calls for help this year! With the addition of text, chat, and email conversations, the 2-1-1 network answered over 14.3 million requests for help. © 2019 Help Network of Northeast Ohio. All Rights Reserved.